This entry was posted in Campus Announcement, Faculty and tagged interim dean, School of Forestry and Wildlife Sciences on June 11, 2014 by Wire Eagle. AUBURN UNIVERSITY – Graeme Lockaby, associate dean of research in Auburn University’s School of Forestry and Wildlife Sciences, has been named interim dean of the school, announced today by Provost Timothy Boosinger. A national search will begin in July for a permanent dean. 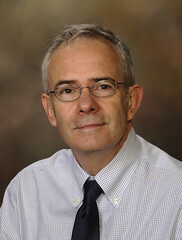 Lockaby succeeds Jim Shepard, who is returning to the faculty fulltime as a professor.